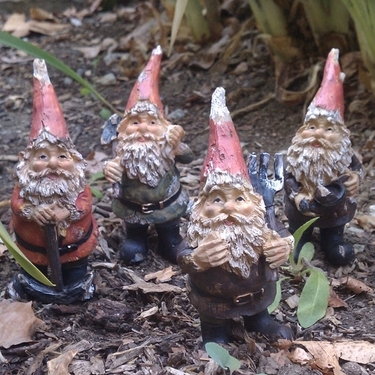 It's tough work being a gnome, and when there is a lot to do our Miniature Gnomes have to work extra hard! We've had many requests to release a mini gnome set and we are excited to showcase these small gnomes. A perfect size for your planters, window sills, purses (for random pictures), around your office computer, and anywhere else you need just a touch of friendly garden whimsy. These super cute tiny gnomes come in set of 4 and include a gnome holding a shovel, a gnome holding a pickaxe, a gnome holding a pitch fork, and a gnome holding a watering can. Two have brown shirts, one green and one red shirt.